Many people associate hot dogs with baseball or Fourth of July barbecues. I associate them with the smell of sweat, hot pavement, and rock ‘n’ roll. As a wild-eyed teenager growing up in the L.A. area, Hollywood held quite the allure for me and my friends. Looking for trouble with our colored hair and leather jackets, we’d pile into someone’s crappy car or hop on the Metro to check out a punk rock show. As we spilled out onto Hollywood Boulevard around 1 a.m., we’d clamor for the ultimate snack: A sizzling, bacon-wrapped hotdog swaddled in tin foil. Now, I’m not sure if the hotdog came first or the desire for a hotdog came first. Anyone who has loitered on a curb in L.A. at a weird hour of the night knows that there are more hot dog carts than abandoned payphones in the city. These proud street vendors—usually older Hispanic women—are as much a part of the nightlife as scantily-clad clubbers or aging rockers. What I remember: sweet, grilled onions, charred green and red peppers, a splurt of mustard/ketchup, and that thick slab of crispy bacon (it never failed to send a dribble down my chin). These were unequivocally American hot dog-eating experiences, albeit not very “traditional.” In honor of the diversity that is this nation, I sought out a diversity of SLO-area dogs as a means of celebrating. This one’s for you, ’Merica—you juicy, bacon-wrapped beauty. Note: North County dogs are just as good, and will be reviewed in due time. How many dogs did you really expect me to eat in one week? 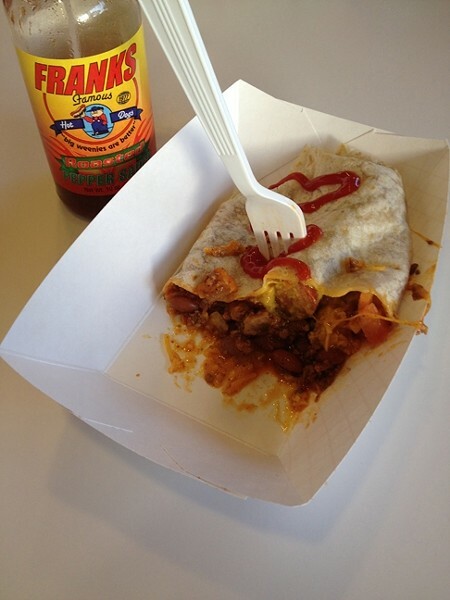 HOT DOG BURRITO: Frank’s Famous Hot Dogs might be known for its chili dog, but the lesser-ordered Mexican Dog (a chili dog wrapped in a flour tortilla) offers maximum bang for your buck. Is it a hot dog? Is it a burrito? Is it … filled with mountains of steamy, beefy chili? The answer to all of these important questions is “Sí.” I ordered the Mexican Dog on the suggestion/dare of a friend, who warned that it was “major fat kid status.” If you live in the SLO area, you’ve probably had Frank’s quintessential chili dog. I, however, wanted to dig a bit deeper—to think beyond the status quo. Thank the hot dog heavens I had my husband around to split the zany dish, which quickly became a hedonistic mess. The flour-tortilla wrapped concoction—stuffed with Frank’s Famous beef and bean chili, onions, yellow mustard, shredded cheddar cheese, tomato, and a meaty Casper’s brand hot dog—literally exploded with flavor. Be forewarned: If you are thinking about ordering this chili dog burrito (let’s just call it what it is) for its portability, think again. Repeat: This is a sit-down meal. Also, you might want to make a bib out of that stack of napkins. Here’s what my husband wisely said about the meal, after a bit of prodding: “It is a horrible idea. But it is also incredibly awesome.” We both agreed that we would really like to know where in Mexico this recipe was derived and purchase a time-share. About $2.60 during Hot Dog Happy Hour (Tuesdays after 5 p.m.). THE OTHER WINDY CITY: The green bean-topped Chicago Dog is a popular request at Hot Dogs on Harbor in Morro Bay. 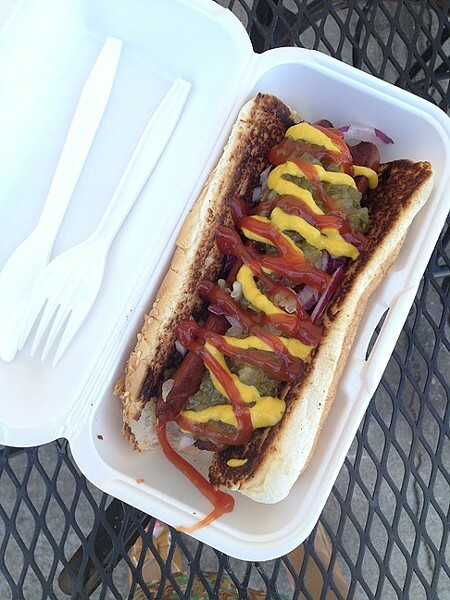 The order-at-the-window eatery uses 100 percent Hearst Ranch grass fed beef in its old fashioned franks. Yes, I’ll take the risk of sounding like I belong at the end of a tired Portlandia punchline. My hot dog was raised responsibly. OK, I’m not sure which cow became my hot dog, or the name of said cow (although I’d really like to know). What I do know is this: The all-beef, nitrate-free frank I ordered for lunch was sourced from locally raised, grass-fed Hearst Ranch cows. The result? A juicier-than-thou frank with undeniable charisma. Topped with snappy green beans, onions, celery salt, tomato, sliced dill pickle, relish, yellow mustard, and cucumber, my Chicago Dog was uniquely satisfying. Plus: A dense, sesame seed bun elevated the snack to a filling feast. This kind of satisfaction calls for jazz hands. 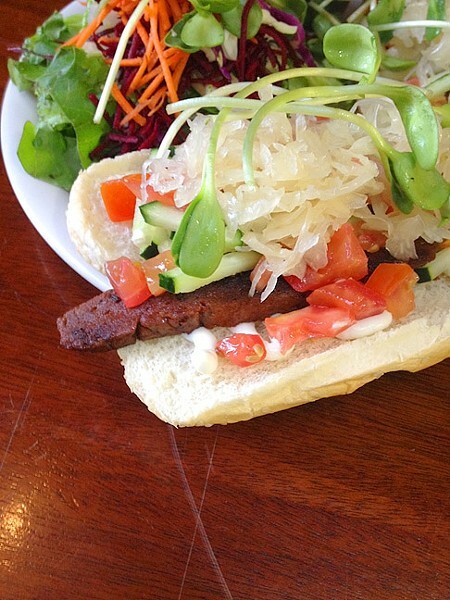 THE SMILING DOG: Bliss Café in downtown SLO offers up vegan hot dogs that feel decadent, but actually rack up good karma points instead. There’s something weirdly American about biting into a veggie dog while gazing at a wall covered in depictions of colorful Hindu gods and goddesses. This, my friends, is freedom of choice. You want a vegan frank topped with organic veggies harvested less than 50 miles away from where your fork is? Check. You want house-made ketchup that actually tastes like fresh tomatoes? Check. How about delicately-pickled sauerkraut that’s still got a true “crunch” to it? Double check. The Smiling Dog plate features two well-seasoned, surprisingly “beefy” Seitan (aka wheat meat) hot dogs nestled between two starkly traditional white flour buns. The mound is complemented by a topping of Vegenaise, cool cucumber, tomato, and the aforementioned house relish. My only complaint: Where was the spicy mustard that the menu noted? I will forever dream of what could have been. Major plus: The meal arrived with a satisfyingly crisp side salad, and you can dress it up with a slew of house-made dressings (try the tahini ginger vinaigrette). Bottom line: Anyone who doesn’t feel grateful while stuffing a veggie dog in his/her maw while reading a blackboard scrawled with spiritual quotes may have some serious karma concerns. DELI DOG: Shell Beach Liquor & Deli may be a convenient stop for coastal booze and jerky, but the old-school hangout also harbors juicy, Hebrew National franks made to order. There’s something about the unassuming hole-in-the-wall feel of a good neighborhood liquor store and deli. It’s a utilitarian, no-fuss experience that—if you’re lucky—can result in killer regional delicacies. Where do coastal locals go for a quick afternoon munch? According to a tip from a local resident, it’s all about Shell Beach Liquor and Deli, which, I soon found, also boasts “the coldest beer in town.” When I strolled into this old-school storefront, I was happy to see a few customers already ahead of me. Good sign. The menu boasted a few tempting burger options, but no wieners that I could see. When I asked the guy behind the counter, he just nodded and asked, “Everything?” I enthusiastically gave a thumbs-up. End of transaction. Not less than three minutes later, I was sitting outside in the sun, slurping down a hot Hebrew National, split in half lengthwise and topped with traditional fixings of ketchup, mustard, onion, and relish. I appreciated the crispy, toasted bun and the less-is-more approach. As to whether they’ve really got the coldest brews in town? That’s for another feature. Circa 1870, Coney Island vendor and German immigrant Charles Feltman began selling sausages nestled in rolls. The “very first appearance” of the modern-day hot dog in the U.S. is still highly disputed. Franks may contain pork, beef, chicken, turkey, or a mixture of all. The meat is usually mixed with water, garlic, salt, sugar, ground mustard, nutmeg, coriander, and white pepper. The end product is cured and cooked. In 1969, hot dogs became one of the first foodstuffs eaten on the moon. Buzz Aldrin and Neil Armstrong paired their dogs with hot coffee, bacon squares, canned peaches and sugar cookies. 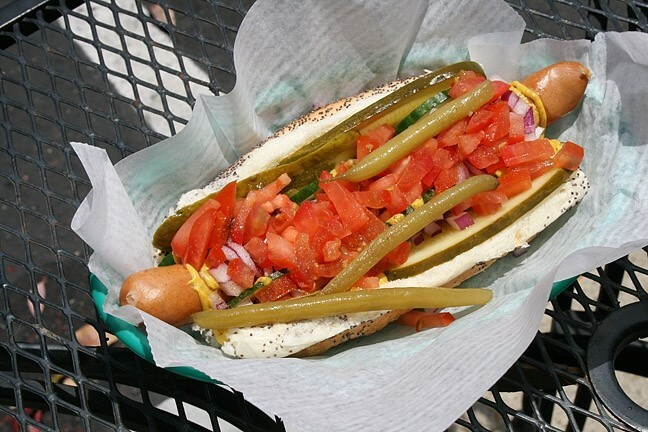 The National Hot Dog and Sausage Council estimate that Americans eat about 7 billion frankfurters during “hot dog season,” which lasts from Memorial Day to Labor Day. Send your comments and antacids to hthomas@newtimesslo.com.